Annual Business Climate Assessment is an annual small and medium-sized business survey which allows to track changes in the business environment. It also serves as a tool which helps reveal barriers to SME development as well as develop a list of economic, legal, and regulatory priority actions (reforms) aimed to improve the business climate in Ukraine. The first ABCA survey was conducted in late 2015. A total of 1,827 SME sector representatives were surveyed, ten focus groups and 83 in-depth interviews with the representatives of executive authorities, expert environment, and business associations were conducted. The survey demonstrates, in particular, how SME assess the current business climate in Ukraine as well as reveals major problems for business and reforms which entrepreneurs expect from the state. Products of the research: (1) an annual analytical report (2) business climate index and other indicators to monitor the situation in the SME sector, (3) database, which is used for various analytical requirements. ABCA is essential to USAID LEV Program. It is an instrument of environmental assessment of SMEs and measures the impact of the Program on this environment. The study will be conducted annually and aims to track the dynamics of change. The central ABCA survey index, the "Index of business climate" in Ukraine, is slightly higher than “0” on a scale from -1 to +1. The main index components are the expectations and assessments of the current situation. Relatively low assessment of the current condition and high expectations indicate that despite unfavorable condition, Ukrainian business environment is reviving. If the state decreases the administrative burden, it will contribute to revitalization of business activity of SMEs in Ukraine in the coming years. The survey of business representatives allowed making the list of key impediments to business development in 2015. In order to structure the key obstacles as well as ensure their further analysis, we broke down these impediments into ten groups which characterize main challenges SMEs faced in 2015. The first place in the ranking belongs to the group of factors which include the consequences of military aggression of the Russian Federation and the general political instability in the country (59%). Second largest group of problems relates to tax legislation, in particular the complexity of tax administration, permanent changes in the legislation, and frequent changes in the tax and other reporting forms (54%). The third group of problems which contributed to limited business activity in the SME sector is associated with unfavorable market conditions, low demand, and high level of competition (48%). The fourth group of problems marks the financial component of SME activities, including lack of funds, high interest rates for credits and other borrowed capital (36%). Fifth in the ranking is the group of barriers associated with high regulatory burden and corruption (36%). The sixth group of factors encompasses burdensome currency regulation and inflation (35%). The lack of skilled workforce and the necessary production capacity represent the seventh group of factors (20%). The eighth place in the ranking takes the inefficiency of the state apparatus (17%). The remaining obstacles account for less than 4%. 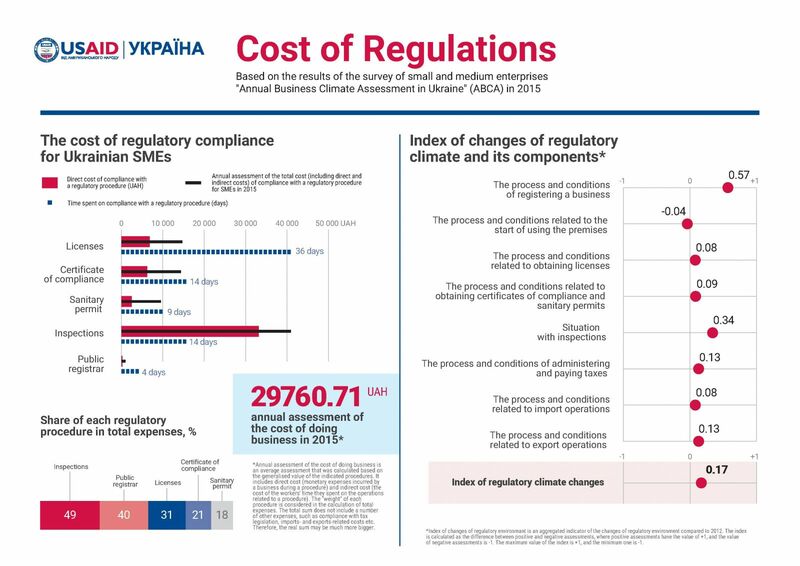 Small and medium-sized enterprises (SMEs) in Ukraine spent a total of UAH 29,760.00 annually and 15% of their time on regulatory compliance. This is exactly the cost of regulatory compliance in Ukraine. At that, the smaller an enterprise is, the heavier is its regulatory burden. As calculated per one employee, the total annual cost for medium-sized businesses make UAH 268, small businesses – UAH 1 145.00, micro-enterprises – UAH 5 952. Quite paradoxically, but according to the survey, the majority of Ukrainian SMEs (86%) perceive the state as a "barrier" or an "enemy" for doing business and almost the same number of businesses (89%) expect direct or indirect support from the state. At the same time, entrepreneurs trust local authorities significantly more (62%) compared to the state authorities (the Government - 30%, President - 25%, Parliament - 22%). This proves high expectations for the decentralization reform.